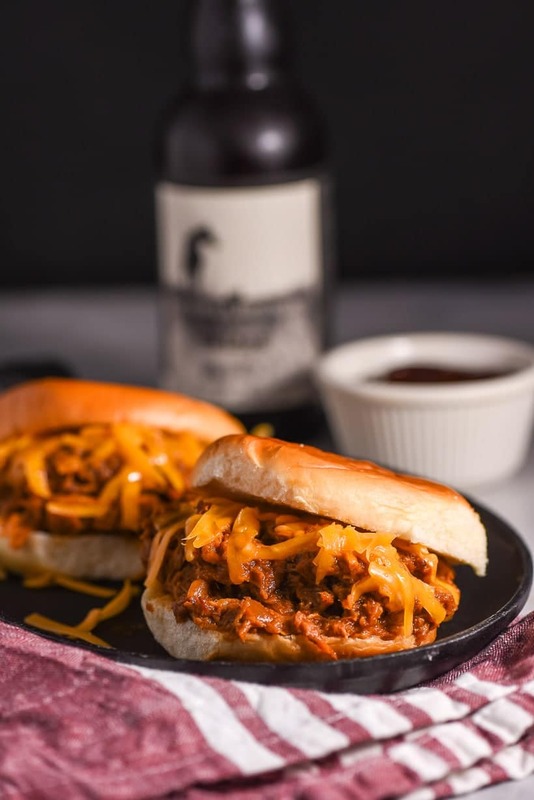 These Slow Cooker Barbecue Chicken Sandwiches are ridiculously easy to make and have all the sloppy, smoky, sweet flavors of summer. Can I tell you something about my little corner of the world? I live in Columbus, OH which is a lovely city with some amazing restaurants, great little neighborhoods, and one of the best college sports teams in the country. I love this city, I really do. But one thing this town doesn’t have going for it is the weather. A few weeks ago I was walking around with a light jacket and open toed shoes, laughing right in the face of grumpy Old Man Winter. Today, it’s cloudy and cold. Like, winter coat and scarf cold. Ugh. Seriously, the weather here is like that flirt in high school who was all attentive and funny one day then forgot your existence 24 hours later. Thankfully, we all moved past that punk. Now, I’m ready to move past this lame-o weather. Ever since that spot of sunshine graced our fair city, I’ve been going crazy waiting for spring. If the clouds don’t break by this weekend, you may just find us out back grilling with our thermals on. This chicken feeds a crowd and is crazy easy to make (and stuff in your face. Seriously, it’s addicting!) 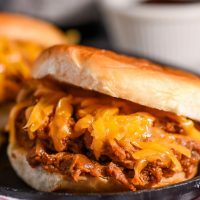 If you can mix sauces together, chop an onion, and throw it all in the slow cooker, you can make this shredded slow cooker barbecue chicken. We like to serve these sandwiches with lots of cheddar cheese on top. If I’m feeling ambitious, I’ll add a little coleslaw mix as well. Our favorite side dishes are this crunchy Cucumber and Tomato Salad (especially in the summer months!) and the Creamiest Mac and Cheese. While these sandwiches are pretty fantastic, my favorite part of this recipe is actually the leftovers. I love to use leftover chicken to make BBQ Chicken Pita Pizzas or add it to a quesadilla like these Leftover BBQ Chicken Quesadillas. This recipe also freezes beautifully, so if you have leftovers, add the chicken to a freezer bag and pull it out whenever you’re in need of another quick, delicious weeknight dinner. 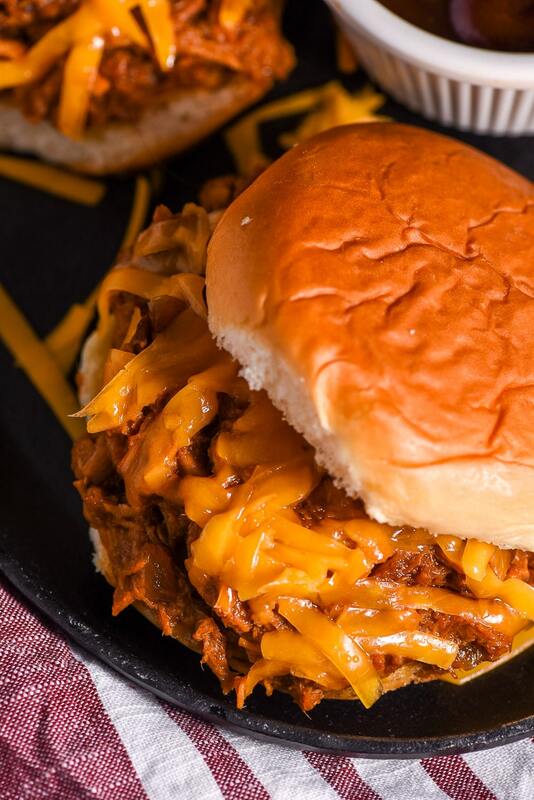 Smoky, sweet, and sloppy slow cooker barbecue chicken sandwiches are ridiculously easy to make. 1. In a bowl, mix barbecue sauce, dressing, brown sugar, Worcestershire, and onion. 2. 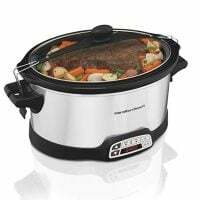 Place chicken in the bottom of a slow cooker. Pour sauce mixture over top. 3. Cover and cook on high for 3-4 hours or on low for 6-8 hours. 4. Remove chicken from pot and shred, using two forks to pull chicken pieces apart. 5. 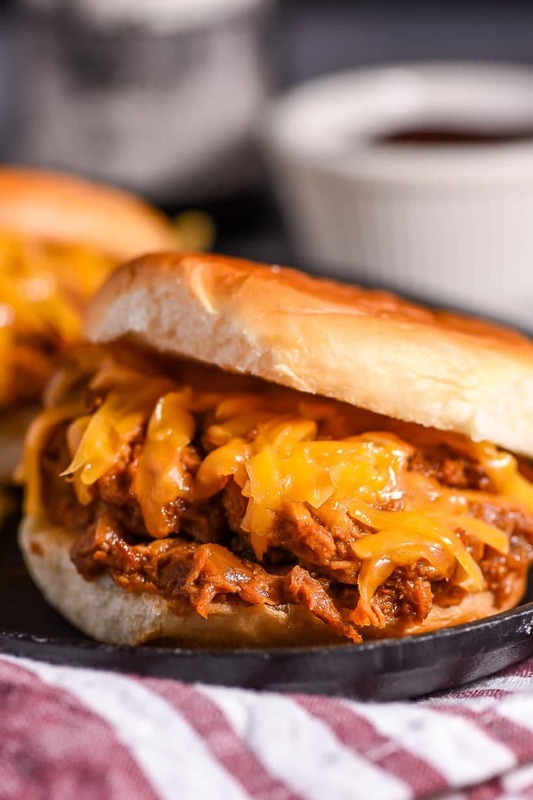 Place chicken back in pot, mix with sauce and serve on buns with cheddar cheese. I like to slow cook these on the lower end of the cooking windows so the chicken is very tender and pulls apart easily. Cooking the chicken longer won't be harmful at all, but the texture will get mushier if it cooks too long. Feel free to add a chopped bell pepper to up the veggies in this.